In the course of its mission, the Mars Rover Curiosity has slowly ascended Mount Sharp, in the middle of the Gale Crater. Scientists are trying to reconstruct the various stages of the evolution of that territory, from primordial lakes to sediment filling, but it’s not yet clear how many sediments got deposited and the erosion caused by winds has to be taken into account. The idea is that the materials that deposited over many millions of years have slowly compressed the ground, compacting it, but there are discussions on these subjects. 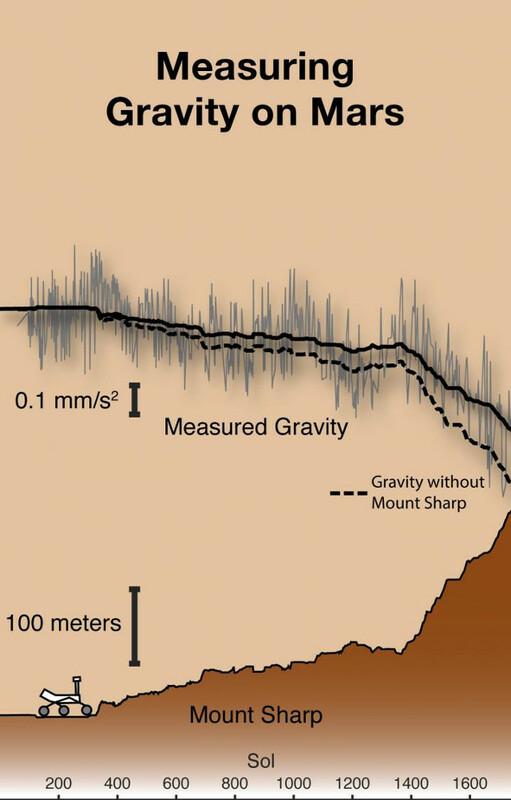 While the Mars Rover Curiosity climbed Mount Sharp, the gravity it felt has changed over time, albeit in a limited way. Curiosity has no specific instruments that can provide direct measurements of these changes but it’s equipped with accelerometers and gyroscopes useful to orient it accurately but also to aim its instruments and its antenna with precision. 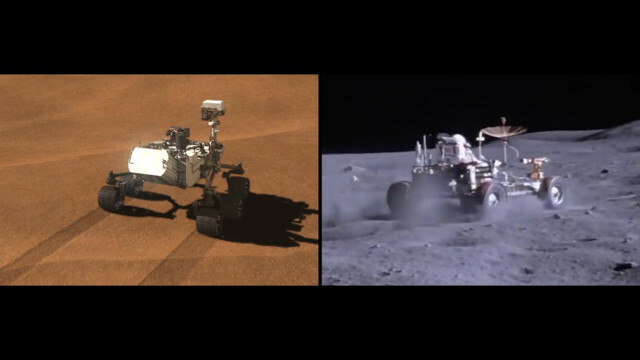 These instruments are similar to those used in smartphones, for example to rotate the operating environment when the user rotates the device, and the sensors also recorded the gravity acceleration along the path where the rover passed. In this research the detections in 700 points were considered. The use of the accelerometers of the Mars Rover Curiosity was compared to that of the Traverse Gravimeter Experiment (TGE) built for the Apollo 17 mission precisely for gravity detections, in that case conducted on the Moon. At the time, the instrument was used in the Taurus-Littrow valley, where the instrument was transported on a Moon rover that stopped in various areas to make a total of 25 measurements. In the Mars Rover Curiosity’s case, the data collected by the accelerometers gave surprising results. In fact, they suggest that Mount Sharp’s lower layers were compacted by materials with a thickness of 1 to 2 kilometers (about half to one mile), much less than what would be expected if the crater had been completely filled. The bottom image (Courtesy Keven Lewis, All Rights Reserved) shows the Mars Rover Curiosity’s path as it goes up Mount Sharp and on top the measured gravity values, marked by the solid line, and the values ​​that would exist without the presence of Mount Sharp, marked by the dotted line. The differences between the two values ​​made it possible to calculate the rocks density. The clever use of the Mars Rover Curiosity’s accelerometers offered a new surprise regarding Mount Sharp’s characteristics. This study helps to better understand the processes that led to the current state of the mountain and Gale Crater, very useful to understand the history of Mars from the era when it was more similar to the Earth to the climate collapse that turned it into a desert to its current situation.